Purchased by Cmdr. Edward V. Horne in 1948 from the Officers Club at the American naval base in Pago Pago, Samoa. 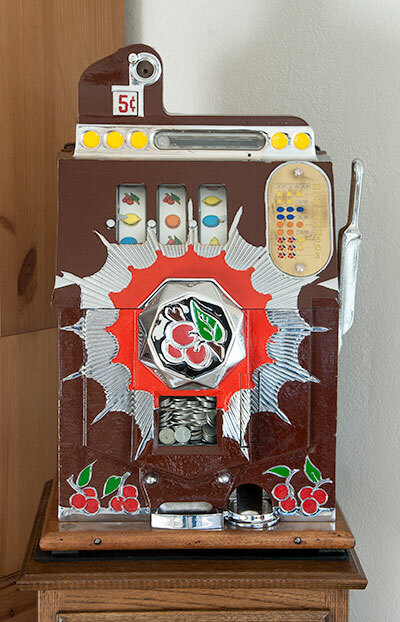 This slot machine was one of many located on American military bases throughout the country and abroad. In the late 40's however, slot machines were banned from military bases and orders were sent directing that all machines be removed and or destroyed. This one was slated to be thrown in the Pago Pago harbor but as is often the case in matters like this, exceptions were allowed and the machines were offered at $5 a piece to anyone willing to haul them off. By that time this machine had been in service for 11 years and would have been considered "long in the tooth" by most casino operators. The "useful" life of a machine of this type in a casino environment is typically about 4 years after which they were usually junked and replaced with newer models. 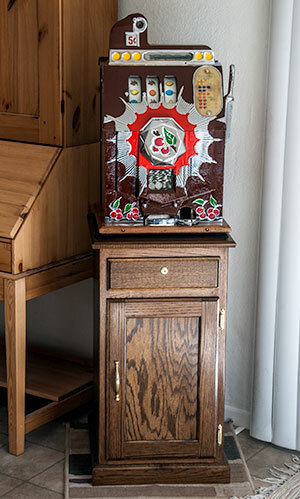 According to John Hayes of San Diego Slot Machine, this one had seen lots of service before it ended up in our hands. Some repairs and adjustments have been made to the inner mechanisms and it was repainted from its original brown to green. Brown or blue were the original color choices but green was not one of them. The models with the brown front predominated and were often referred to by repairmen as "The Brown Front" slot. Another feature of this machine is that it is made from cast iron rather than aluminum. Although that puts it into the "rare" category, the aluminum bodies are considered more desirable as they are lighter and show a smother, shinier surface when painted. Cast iron was only used for a short period of time and because of weight and a tendency to pit and show surface mottling, they were changed to aluminum early in their production. 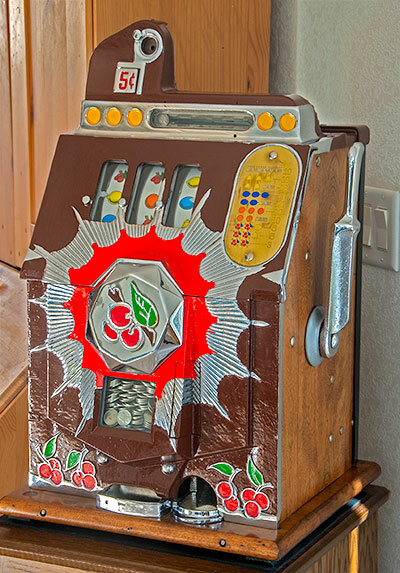 I had this machine restored as close as possible to its original color and condition by John Hayes of San Diego Slot Machine in Nov of 2014. Personal note: My first memory of this machine was in 1955 when it was sent from our house in Chevy Chase Maryland to China Lake California where my father was the base legal officer. 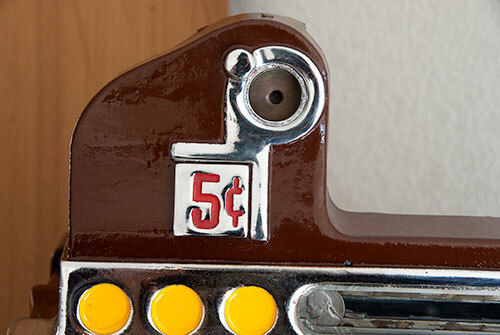 Like most 5 year olds I was fascinated by the machine and not just because I could swipe nickels out of the back and buy candy at the Navy Exchange. Even then it was considered a collector's item and it traveled with our family 2 more times across the US. It never stopped being one of my dad's most prized possessions. At our house in Coronado it was placed in the back apartment on a somewhat tipsy wooden shipping box. During those days Dad's biggest concern was that one of my sisters children might be crushed if the thing fell over on them. When she visited he would send me to the back to check on them to make sure they were careful. Note to family - 11/14: I’ve been doing a bit of research and refurbished slot machines of this type list in the $3,000 range though they usually sell for less. It looks nice though at over 70 years the cast iron metal is a little rough and not as smooth as the aluminum models. All the showing metal parts were re-chromed including the handle. Mechanically it was completely rebuilt and works perfectly. Obviously, it looks nothing like the machine that dad brought home in 1948. I miss that. On the other hand it is now painted in a color pattern and style that is accurate for its time period. Best guess is that it probably started out in a casino somewhere and after a useful life was then auctioned off to a business that recycled old machines. At that point it was probably re-built and painted the colors that we knew and sold to a vender with connections to the navy. I’ve written down its history and attached it to the inside of the machine so that the provenance will always be with it. Although it’s not a priceless relic it is an attractive collector’s item. I’ll think of myself as the custodian and try to keep it safe till it’s time to move it on.